Click on thumbnail image to play audio. 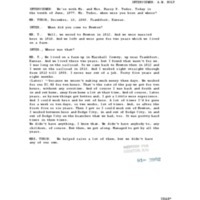 Scroll down to view the transcription document; press Ctrl+F (Windows) or Cmd+F (Mac) to search within the file. Harry and Vonnie Tudor discuss what life was like working on and around the Newton, Kansas rail road systems. The discussion ranges from topics on coal, labor, childbirth, history, and Harry's distant cousin, Queen Victoria. Copyright 2015 Newton Public Library. All rights reserved. May not be reproduced without permission. To request permission, contact Newton Public Library, 720 N. Oak, Newton, Kansas 67114. Phone: 316-283-2890; Email: library@newtonplks.org. Please credit Newton Public Library, Newton, Kansas as your source. Newton Public Library, Newton Kansas, “Harry and Vonnie Tudor Interview,” Digital Newton, Kansas, accessed April 22, 2019, https://newton.digitalsckls.info/item/768. the tenth of June, 1977. Mr. Tudor, when were you born and where? MR. TUDOR; December, 13, 1886. Frankfort, Kansas. INTER. :	When did you come to Newton? here in 1910. And we left and were gone for two years which we lived on a farm. MR. T.; We lived on a farm up in Marshall County, up near Frankfort, Kansas. And we lived there two years, but I found that wasn't for me. I was long on the railroad. So we came back to Newton then in 1912 and I went on the railroad in 1913. And I worked right straight through from 1913 till 1960. I never was out of a job. Forty five years and eight months. (Later) --because we weren't making much money them days. We worked for our $2.45 for ten hours. That's the rate of the pay we got for ten hours, without any overtime. And of course I was back and forth and in and out home, away from home a lot at that time, And of course, later years, as by now things got better and, I got a little more experience. And I could work here and be out of here. A lot of times I'd be gone for a week or ten days, or two weeks, lot of times. And, so after the first five or six years. Then I got so I could work out of Newton, and I worked between here and Dodge City, in and out of Dodge City, in and out of Dodge City on the branches that we had, too. It was pretty hard times in them times. We didn't have anything, I know that. We didn't have anybody to, any children, of course. But then, we got along. Managed to get by all the years. which progress made things different, you know. Like I was telling you, from the hand-fired, coal burning engines. And then we went from that. They had what they call a stoker on the on the larger engine. Then they had to auger the coal in. We had a fireman to regulate that. Then we got the oil burners. And that was quite an improvement. But these tanks were behind the engine, attached to the engine for the oil, and also for the coal. They were right behind the engine (the tender). They were fastened, attached to the engines, the supplies for the engines. Tender, the tender, that's what it was. And we'd fill and we'd have the oil here and we'd wouldn't have, and I wonder if burning coal, we'd have to re-coal a lot of times in Hutchison or at Great Bend and at Kinsley, we'd take coal. And lots of times, oh they'd shovel anywhere from 10 to 15 tons of coal, in that engine up that hill. Sixty five cars was a pretty big 'train in them days. And of course going on east, because we had a few more then, but most generally 65 cars was a big train. Now then I've seen the other day I saw one here, it looked like about 200. We'd come home and that train, well I just said to my wife, "That's the largest train I ever seen. I hope I don't have to have any more to do with them. " Santa Fe has just completed this last year a new yard at Barstow California, which cost $28,000,000. That's what they call a hump yard. They hit the cars, and they just let them go down and they have a tower and they press a little button. That sends the cars and that's c1assification yard. They'd just make up a train, or let a car down this track or down this track by a button up in a tower. Man sits up there, throws the switch. He just starts the cars just real slow. Then they have a retarder, when they get going too fast, they have a retarder on them, electric thing comes up and slows it down. So you can see what that's done. That's quite an improvement. you see, you had to work under what they called a federal law. And you couldn't exceed 16 hours, without a period of, if you worked 16, full 16 hours, you had to have 10 hours' rest, before you could proceed, regardless of where you were. You couldn't work to exceed that 16 hours without 10 hours' rest in that period of 24 hours. because they'd manage to get you to a terminal. Sometimes they wouldn't, and then they'd have to send another crew out, pick you up and take you in to the other terminal, see? Yeah, you'd tie up, what we call tie up on the law Sixteen hours. Occasionally did that. And me, it'd be l6 hours lots and lots of times. And still working for that $ 1.04.--$5.00--$2.45--that's what we were making. Then we got a pretty good raise. We jumped from $2.45 to $2.78 as a brakeman. Now that was a pretty big raise. I'd been worth a million dollars if I'd 'a made that back then them years. A brakeman now makes around $ 1800 a month. That's right. Well, it doesn’t seem possible. Of course you've got things that are different, too. You’ve got to consider what they have to, now like their holdings and taxations and all that. That's not all net. That's just probably a gross and they don't work long hours, they’ve got now what they call a 12 - hour day. They don't exceed 12 hours in any 24 - hour period, without the rest, see, the law's changed on that. INTER.-; Is it sill a 10 - hour rest following? MR. T.; No, its 8 hours or 12 hours, or a hundred miles. They work with the miles. And eight hours is considered a hundred miles. That the way they work. And it's 12 hours; they can't exceed 12 hours on the law, without taking their period rest. INTER. : And then that period of rest, how long is that? hours because they work them 12 and 8, you see. That's quite a bit of difference than what it was in them days. INTER.- Quite a bit. You had a lot of Mexican - Americans working with you, Mexicans. you know, track departments, where they maintained the tracks and that's about the most of them. And around the shops. And laborers around the shops. They had to have a certain amount of that, you know. They had a lot of 'em. You used to get those fellows from, they'd bring 'em up here from El Paso, when Hanlon Supply, maybe you never heard of them. MR. T. Well, Hanlon Supply would go to El Paso and get Mexicans and bring them over the line bring 'em up here, and they had the Hanlon Supply Company that furnished them their groceries and their clothing and all at a cost, and that was deducted out of their pay, and they'd feed them and they'd have . a card for them to live in. They were track men. Worked on the track. And they'd get them up here and keep 'em six months. Well then they'd take that bunch back and get a new bunch. That's what they call aliens, wetbacks. So, that was quite a thing, too. Hanlon Supply, you know they went all over the Santa Fe. They furnished them people. Like they do in a lot of track work, you know. They'd have a whole gang of them, maybe 150 or 200 out there working on the track. And they did pretty nearly all that work by hand. Now of course, they do it by machinery. Oh, that's quite a thing, to look back and see what they did. They don't do the work they used to do, though. They don’t keep the right of way like it used to be and keep the ballast all lined up and everything and the weeds cut, and all that. They kept all that cleaned up in my--They don't do that anymore. did that come into existence? six inches shorter, six or eight inches shorter. They have a big saw. They just saw them off like you would with a board. They saw the end off of that rail. And they handle all that through Newton, They'll bring several carloads in you know. just where it's located right now. Maybe it's Albuquerque. 1 don't know where. But anyway they take these rails and put 'em together. Then they weld 'em. And they weld 'em, and one rail will be 1^)20 feet long. That's quite a distance. Yeah, that's quite a distance. That's what they do and all. They call it a welding rail. That's a welding rail. And that saves all these joints. Where they don't have to have joints. That's where they get to working loose. And they'll get to working. And you'll hear 'em hit. You've been on a train where you hear the nails c1icketyck1ick? Well that's what it is, it's the joints. Well now, you see, you only have one joint every 1^20 feet. And they'll have one on here and then they'll offset it, see, so the joint will be on the center on, that, the next rail will be in the center, don't you see. So that's quite a thing, too. And of course they went from small rail to a higher rail. And the rail was say oh eighty pounds or seventy five pounds rail. whole thing cost me $21,00. HR. T. Well, when they had steam locomotives, they'd have to put them in and work on 'em and turn 'em. But now with the diesels, they don't turn them diesels. They can put that, all they have to do is change the engine and use that other ramps. Or else they can go around the y with it. They had to have the roundhouse when they had those steam locomotives, 'cause see, any come in from the west, they'd put it on the turntable and turn it around and service it up, get it all ready to go back, go west, you had to turn, head it west. And they put supplies on it, put, they'd oil it or coal, and they'd set It out in the yard and have it ready to go. Just enough to keep the steam alive. That's what they used the roundhouse for. Then they had a machine shop, too. There they could run, when they had to do heavy work, they ran the machine shops. And a lot of times they could turn the engines and put it in there. And they had the tender, they had the tender always fastened to the engine, always kept that with 'em. So that was their supplies. the coal and the steam, would you say? and the tank. And they put them on that turntable. And they had a little power thing and it would just turn them right off, put 'em on another track. It would have tracks going out from that, barrels going out from tracks, you know. Maybe they'd want to put one over here and one over here, well they'd turn, put the engine on there and turn it, to that track and run it off. That turntable, lot of that that turntable was, about 150 - feet long. Had a big pit, you know. And...put an engine on there and then they'd turn it around wherever they' I want it. That's out now. They don't use that anymore. I don't think they've even got one here. I think they took it away. A lot of things happened, of course, different times. People on the trains, losing their purse, and losing their ticket and all that kind of things. MRS. T.:	And women having their babies on the train. INTER.-:	Tell me a little bit: about that. and she had a little boy about two and a half, wasn't he, Vonnie? I took the little boy and took care of him all the time. So I told them to have an ambulance at the station down here at Newton when we arrived. And they did, so we took them. And I had the little boy, held him took him and put him in the ambulance. So that night, the little baby was born. Mrs. Tudor went to the hospital to see her. She went over to see it. That was quite a deal. MRS. T. She was grateful for what they did for her, you know, to help her take care of the little fellow and all, while she was having trouble. and held him, and he was just as nice just a cute little fellow. Course I like kids anyhow. And I got along fine with him. on these trains at one time. And, but they didn't have any that night. INTER. ;:	The Santa Fe hired them or how was that arranged? MR. T.; They just had to help. It was on the people who were on the train, see? So everybody was always nice, you know. And of course they helped me out, too. And they took care of the children. He took her in and took her to the hospital. That was quite a thing. And Mrs. Tudor went to the hospital to see the little lady and the little baby. INTER. :	That was nice of you. know. She was among perfect strangers. So I know I would have appreciated something like that. especially during the war, and we'd have young women on the train, you know that had never been any place, and they were just married, their husband was in the service, and they didn't know anything about traveling. And they'd be going long distances. You know I'd always try to help them out, try to do things. One time in particular, we were going to San Francisco on a trip and we were on the train. And this girl was on there. And she didn't have anything and she didn't know where she was going and she'd never been any place. She didn't know how to travel. So we took her under our wing until we got to San Francisco, and kept her and took her down and put her on the bus, wasn't it? the bay over to San Francisco and put her on the bus to wherever she was going --out in Nevada, somewhere in the hills out there I think. And that kind of thing, you know. Young girls that had never been anyplace. INTER. : And they just were having to strike out to go somewhere? MR. T.: Yeah, well, no, they'd been wanting to get to see their husbands, and maybe they'd just go. They didn't have any money. Maybe a ticket and that's all they'd have. Well just think what they'd be. Now that one girl in particular, you remember, Vonnie, what she was. MRS. T.:	Oh wel1, yes. just helpless. All by herself and going out in that country. She didn't even know where she was going or anything about it. had a couple of grips. And when they stopped, over at Hutchinson to get off, the porter took her grips and set them off on the platform and she got off. Well, somebody was supposed to meet her. We 11, they didn't show up. Well she went down on the platform and left her grips set there. So soldier boy thought he'd be a Good Samaritan. He gets off and he seen her grips, and he thought somebody's left 'em. So he sets 'em back on the train. Here the woman was with a little baby and all her clothes going to Kansas City. She was in Hutchinson. So they got a hold of me and wanted to know what I knew about it, somebody had got off. Well, I said all right, we'll take 'em off at Newton and send 'em back over to Hutchinson. So that's what happens, just things like that. INTER. :	You were very accommodating, the Santa Fe. like that happened. Just when somebody thought he was doing a good deed, see? He just thought somebody had left them. He just grabbed 'em and set 'em back on the train. wi th the Santa Fe? know. They'd go clear through. Some of them would go from oh, say, Pascola to Albuquerque. They'd be assigned to that train. They had one nurse for each train lots of times, you know. Them days they didn't. But then later on they did. And they'd have a nurse on there. They were a big help, too. They did a lot for people. But they, course they finally did like everything else, they took that service off. So that was one service that I always thought that they especially needed. Especially women with children, small children. They needed care, you know. Lot of times if they had a nurse they could go a lot farther. INTER. :	It was good that it was on that long. to Denver. And they ran daily and 9 went west and 10 went east. I'd rather today ride on a train than would go on a plane. Well, we've had some nice trips on the train. When we '.d go east, we'd have some nice trips. And she had a nephew and they lived at Long Island, New York. And we'd go to Chicago on the Santa Fe. Then we'd get on the Eerie in Lakawanna. Then we'd go up there and he'd come across and meet us over, well, as we'd go. to Holbrook in New Jersey. (Edited.) I'll take the train any time. We were on the Band O that one time didn't we? We did go into New York. Went on the Band 0. No, we went to Washington, D.C. on the Band 0. Then we took the Pennsylvania across to Long Island, don't you remember, and we went on that commuter train. And we were practically all day in going over. And it was a terrible thing. Did you ever ride one of them commuter trains? Well, you know what they are. I don't have to tell you. And here you are with two grips, you know. You don't know where you're going and nobody else will tell you anything. INTER. :	And you think you might be robbed. Chairman system retirement bureau, dated August 9, I960. Congratulations. he was gone so much of the time. But I was always busy. I was the leading dressmaker here for 27 years. And then I worked downtown in the different places. I helped them in the jewelry stores eighteen years at Christmastime. INTER. :	Which one, which jewelry store? MRS. T.: Well, yes, worked in the U.S.O. I was a lieutenant. MR. T.:	Served the train, the soldiers. course, the boys would come on over to our U.S.O. group. MR. T.:	They had a station right there off of Main Street. They had a station right there off of Main Street, where that old vacant laundry. That was the USO station. The boys, they'd, all come in. They'd serve them drinks and cookies and sandwiches. Yeah. A whole trainload would come through. And they'd block over there, you know, they'd serve all them soldiers. think it was the nicest fall festival we ever had. Not because but I was chairman of that. And we had big ones there. We had, oh, girls running for queen, you know, and that was a lot of fun. Oh well I was always busy. 1 never lacked for anything to do. I made clothes for everybody. 1 made suits and coats and dresses. Oh I sewed for an awful lot of people here. MR. T.: Tell her about your little store you had. The Jack and Jill shop. what year was it Harry? MR. T.: It's been so long ago I can't remember. MR. T. :	Hemstitching. You had a hem stitching machine. she wanted to get married and she wanted her money so, I didn't feel that I wanted to go on after, so we closed it out. I was always busy. II,	1930." And that station was built probably you know about 1327- And then, that's one view of it, and this is the other view of it. A lady in Arkansas City sent me that. I didn't have one and she sent it, though, so I'm going to give it to the historical society, and they'll have it down there, because, when I'm done with it and when I'm gone, nobody will ever know in ' years to come, they'll want to know when was that station built. Well that was taken; we know it was that old. See that's forty years. It tells who took the picture on the back, a fellow in Arkansas City. side of the station. And that was in that walk that goes right on that walk; and had a water fountain. INTER. :	How do you pronounce that correctly? Queen Victoria, fifty second cousins. MR. T.: We had hoped that in time that they will get back to get more service. Cause its cut off some service that they really ought to have. Now all of our trains south and west, southeast, have been taken off here. We don't have any service that goes down to Amarillo, and up to Albuquerque any more. We used to have trains go down and out to California. We don't have them. And that's one service we need. And these other places, the same way. And the service out of Chicago is poor. We'd like to go to Detroit. Well of course, now, we fly, because you gotta go to Chicago and you layover six or seven hours to get a train that goes into Detroit. And then you get in there along in the middle of the night. That's bad, you see. (Edited.) But I hope that in time they will. They have improved it though in the last couple of years.• And they have put on some more trains. They're talking about getting another train through to the west coast. I don't know whether they'll go Union Pacific or whether they'll go Santa Fe. 1 hope it goes Santa Fe.